To elevate lentils from the ranks of health food to a dish of marvelous complexity, just add some caramelized onions. 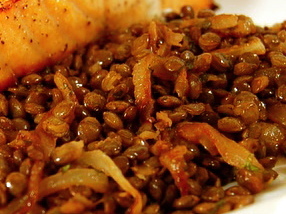 The sweetness of the onions provides a perfect contrast to the earthiness of the lentils. Set a medium-sized, heavy skillet oven medium heat. Add oil and butter. When butter is melted, add the onion and a generous pinch of salt. Turn down the heat to medium-low. Cook, stirring occasionally, until onions are tender and medium-brown, about 40 minutes. Add balsamic vinegar (optional) and cook, stirring occasionally, until onions are dark nutty brown, about 10 minutes. Drain lentils and add to onions. Cook, stirring occasionally, until lentils are warmed up, 5 to 10 minutes. This recipe comes from Helen Rennie's article about lentils.